A merry end to the holiday season from your friends in AdSense! A few of us from our North America team are pictured below to send some additional cheer. Hope you have a great end to 2010 and a fantastic start to 2011! Wishing you a very happy holidays from all of us in AdSense! 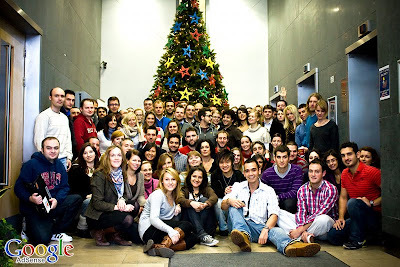 Our team in Dublin is pictured below to send you extra season's greetings. We hope you learned something with our video series and are continuing to enjoy the new AdSense interface! We’ve given you a tour and covered the greater insight and control that you get with the new AdSense interface, but we couldn’t end the series without a video about the improvements in account management. The new interface lets you find features and make changes to your account more efficiently than ever. You can also get help when and where you need it with relevant help links customized to the content of each page of the interface. to Google Apps that made dozens of Google services, including AdSense, available to Apps users for the first time. Before this improvement, Google Apps users had to create a separate account to sign in to AdSense; now, Apps users can access their cloud-based productivity applications along with AdSense using the same account. For those of you who also have a Google Apps account, we're in the process of finalizing the infrastructure that will allow you to seamlessly transition your existing AdSense account and data over to your Google Apps account. For new users, if your Apps systems administrator has enabled AdSense, you can begin using this services with your existing Apps account at google.com/adsense. If you haven’t started using Google Apps yet to manage collaboration for your business, learn more about how to lower IT costs and improve productivity at google.com/apps. Google Apps is Google’s suite of cloud-based messaging and collaboration apps used by over 30 million users in small and large businesses, educational institutions, government agencies, and non-profit organizations around the world. Apps includes products such as Gmail, calendar, documents, spreadsheets and more, specifically optimized for use in organizations. We recently launched an improvement to Google Apps that made dozens of Google services, including AdSense, available to Apps users for the first time. Before this improvement, Google Apps users had to create a separate account to sign in to AdSense; now, Apps users can access their cloud-based productivity applications along with AdSense using the same account. , we’re delighted to release the feature to all publishers in English-speaking countries. General category blocking is an important update to the new AdSense interface that offers you more controls over the ads that appear on your website. It helps you scalably prevent competitors’ ads and ads that you might not find suitable for your audience from appearing on your site. With this new control, you can opt out of receiving ads from across 170 specific categories, including finance, travel, job, and automotive. We show the percentage of total revenue and total impressions for each category to give you insight into the categories of ads that appear on your site and the relative spend in those categories. Keep in mind that blocking categories may have a negative impact on your potential revenue so it’s important to review the % of total revenue and total impressions carefully before deciding to block a certain category. This feature is now available to all publishers in English-speaking countries in the new AdSense interface. General category blocking will initially apply only to ads in English, regardless of the language of the site. We are working on expanding it to other languages in the future. We hope this feature will address the feedback we’ve heard from many publishers who want a way to quickly and easily control the ads appearing on their site. Please leave us comments on how you find the feature. Following up on our announcement that we’ve been beta-testing a new category blocking feature, we’re delighted to release the feature to all publishers in English-speaking countries. General category blocking is an important update to the new AdSense interface that offers you more controls over the ads that appear on your website. It helps you scalably prevent competitors’ ads and ads that you might not find suitable for your audience from appearing on your site. With this new control, you can opt out of receiving ads from across 170 specific categories, including finance, travel, job, and automotive. We’d like to share a final holiday reminder about our placement targeting series and summarize the tips we’ve shared over the past few weeks. 1. Make sections of your site available to be targeted directly by AdWords advertisers with ad placements. These easy-to-implement changes will make your website and channels more marketable to advertisers, which in turn will increase your overall earning potential. 2. Market your website with DoubleClick Ad Planner so advertisers can easily locate sites like yours that match their target audiences. 3. Optimize your ad units by enabling both text and image ads, using top-performing ad unit sizes, and placing ads ‘above the fold’ so that they’re immediately visible to your users. We hope you enjoyed our placement targeting series. Check out the Help Center or watch the video below to learn more. the Behind the Scenes videos in the U.S., many of our international publishers wrote to us saying they would also like to meet their local AdSense teams. So, after countless hours in the production studio, here they are! Meet the people who help publishers earn more revenue in Australia, Poland, Netherlands, Brazil, Germany, Japan, China, France, South Africa, and the Spanish-speaking world here, or watch the videos below. If you’re a publisher from any of these markets, feel free to comment and say hi. Your local AdSense team will be excited to hear from you! AdSense is an international product. We’re available in more than 200 countries and more than 36 different languages. Working with publishers and Googlers from around the globe is one or our favorite things about being on the AdSense team, and we’re proud to welcome readers from all over the world. After we posted the Behind the Scenes videos in the U.S., many of our international publishers wrote to us saying they would also like to meet their local AdSense teams. So, after countless hours in the production studio, here they are! A common request we’ve received from publishers using AdSense for domains is to make it easier to park your currently unused/undeveloped domains with Google. We’ve listened to your feedback, and are now pleased to announce that we've simplified the process of setting up AdSense for domains. As of today, to get your domain setup with AdSense for domains, you can simply delegate your domains’ nameserver to Google’s DNS nameserver. This is typically a single step with your registrar, and simpler than the old method of changing A records and creating CNAME records. You can still use the old method if you prefer, and domains that are already set up will continue to work. To get started, review our instructions for delegating your nameserver to use Google’s DNS nameserver in our Help Center. If you own any domains that you haven't yet had a chance to develop, now is a great time to sign up for AdSense for domains. on Google Affiliate Network, we explained how you can supplement your AdSense earnings with affiliate ads, which are ads that reward you with a performance fee for driving sales. This holiday season, all AdSense publishers have the opportunity to access exclusive affiliate holiday offers from more than 20 Google Affiliate Network advertisers and earn a performance fee from each sale. The deals will be available on Monday, December 13, one of the busiest e-commerce days of the year. How do I promote these deals on my site? To promote any of the exclusive affiliate holiday offers on December 13, you need to be an approved publisher in the Google Affiliate Network. Once approved, sign in to your account and find advertisers participating in the affiliate exclusive holiday offer program via the Announcements section within the Home tab. Apply to the participating advertiser programs via the Join link within the Advertisers tab or directly through this blog post. Tracking links will be available in your Google Affiliate Network account via the Announcements section within the Home tab on December 6. You can also locate “December 13 Offer” links in the Links section on December 13. When can I post the deals? The offers will not be live or valid until December 13, and all offers will expire at midnight Central Standard Time. Affiliates may not post offers until December 13. To learn more about Google Affiliate Network’s exclusive affiliate holiday offers, please visit this blog post. In our last post on Google Affiliate Network, we explained how you can supplement your AdSense earnings with affiliate ads, which are ads that reward you with a performance fee for driving sales. We’ll see you next week for our last video in this series on the new AdSense interface. Don’t forget the popcorn! Stay tuned next week for another video! Last week, three other AdSensers and I went up to Seattle for our sixth AdSense in Your City event. After visiting Mountain View, Santa Monica, Chicago, New York, and Boston over the summer, we didn’t want our publishers in the Pacific Northwest to feel left out! Greeted with beautiful weather on Wednesday, we spent the day at a coffee shop meeting those of you who were free to drop in for a one-on-one consultation. Over pastries and cappuccinos, we chatted with publishers about ways they can earn more with AdSense, learning their stories and providing optimization tips. Everyone we met was incredibly friendly, sharing how AdSense has allowed their business to grow and offering suggestions to help us make the most of our time in Seattle. After checking out the Space Needle and Pike Place Market, we headed back to Kirkland to gear up for another day of optimizations. We were thrilled to have publishers from Washington, Oregon, and Canada join us on Thursday for the event at our Kirkland office. Splitting up the group for optimizations, half consulted with us on their sites, while the others networked with each other, swapping stories about their own AdSense experiences and sharing tips and tricks. It was a great way for everyone (including us!) to learn something new and make some great connections. We hope to hold more AdSense in Your City events in the coming months so we can continue to meet more of you in your hometowns. Want AdSense to come to your city? Leave us a comment to tell us where you are! We update this page regularly to keep you posted about our progress as we work toward a resolution. We also record recently resolved issues so you can check if something you've experienced in the past has been fixed. In fact, we now have two Known Issues pages, one for the old interface and one for the new interface. This way, you'll know if an issue pertains to the interface you're using. If you don't see your issue listed, join the discussion in the AdSense Forum to see if other publishers are experiencing the same thing. We monitor your feedback in the forum to help identify issues, so if multiple publishers are discussing a similar concern, we’ll be sure to escalate it to our engineers immediately and post any details and workarounds to the Known Issues page as soon as possible. You can also report an issue about the new interface to our product teams directly from the interface by clicking the 'Report Issue' link available on the top of every page. Thanks for staying on top of your account! We’ll do our best to keep everything working as smoothly as possible. We work hard to make sure that AdSense is always up and running smoothly. Even so, there can be slight issues, and when those happen, we try to resolve them as quickly as possible. To keep you informed about any issues our engineers are tackling, and provide you with workarounds so you can continue to effectively manage your account, we want to remind you about the Known Issues page. This Saturday, our engineers will be performing routine site maintenance from 10am to 2pm PST. You'll be unable to log in to your AdSense account during this time, but we'll continue serving ads to your pages and tracking your clicks, impressions, and earnings as usual. In addition, your ad targeting won't be affected. that we were starting to test a new interface with a limited group of publishers. Since then, we’ve been focused on adding new features and incorporating feedback from our testers. Today, we’re excited to announce that we’re rolling out the new AdSense interface to all publishers globally. You should now see a “Try the new AdSense interface” link appear in the upper corner of your account. Clicking the link will bring you to the new interface. You’ve told us that data that helps you better understand your performance is critical to growing your revenue, so we’ve made sure that the new interface gives you more insights. You can now run even more detailed performance reports by ad type, ad size, ad unit, targeting type, and bid type for total earnings and other metrics, over custom date ranges. You’ll also find graphs of your data on the new Performance reports tab. You can quickly view impressions, clicks, and earnings all in one graph, compare text ad performance to image ad performance, compare date ranges, and easily analyze data to recognize trends. You’ve continued to let us know that protecting your brand by having control over the ads that run on your site is extremely important, so we’ve improved our ad controls and made them easier to use. All ad controls are now in one place, on the Allow and block ads tab. Here, you’ll be able to filter ads from specific advertisers, categories, and ad networks. In addition, you’ll notice that we’ve updated the ad review center to make it easier to review and manage ads that have been placement-targeted to your sites. You can now search for ads in the ad review center by ad type, keyword, URL, or ad network, and choose to allow or block them. You’ve shared with us the need to manage your account more efficiently, so we’ve redesigned the interface to help you complete tasks quickly and easily. The new interface allows you to quickly see your earnings and payment information, find relevant features, and make changes to your account. It also brings relevant help and other resources, like videos and blog posts, right into the interface, so you can get the information you need without leaving your account. We encourage you to give the new interface a try. To learn more, check out google.com/ads/newadsense. You’ll find additional videos, including a tour of the new interface, information about new features, and a getting started guide. You can also join the conversation in our Forum to share best practices and discover what other publishers think about the new interface. UPDATED Nov. 11, 2010: All AdSense publishers now have access to the new interface, as our Engineering team was able to speed up the roll out across all accounts. Last November we announced that we were starting to test a new interface with a limited group of publishers. Since then, we’ve been focused on adding new features and incorporating feedback from our testers. Today, we’re excited to announce that we’re rolling out the new AdSense interface to all publishers globally. You should now see a “Try the new AdSense interface” link appear in the upper corner of your account. Clicking the link will bring you to the new interface.
! Like our other Inside AdSense blogs, it will provide readers with optimization tips, product announcements, and other program information to help our Polish publishers maximize their earnings and make the most out of their Google AdSense accounts. There’s been an increase in Google AdSense interest within the rapidly developing Polish online advertising market. We’ve been supporting our Polish publishers through our Help Forum, where they can share experiences and help one another with their AdSense-related issues, and are thrilled to be taking the next step with this new information platform. Joining English, French, Italian, German, Spanish, Russian, Dutch, Turkish, Portuguese, Japanese, Chinese - Traditional, Chinese - Simplified, and Korean, Inside AdSense Polska is our fourteenth Inside AdSense blog worldwide. Check out the right navigation bar under the header “Related Google Blogs” for links to all of them! We hope to launch additional Inside AdSense blogs in the future so we can continue to reach even more of our global publishers. Wherever in the world you are, we hope to see you Inside AdSense! 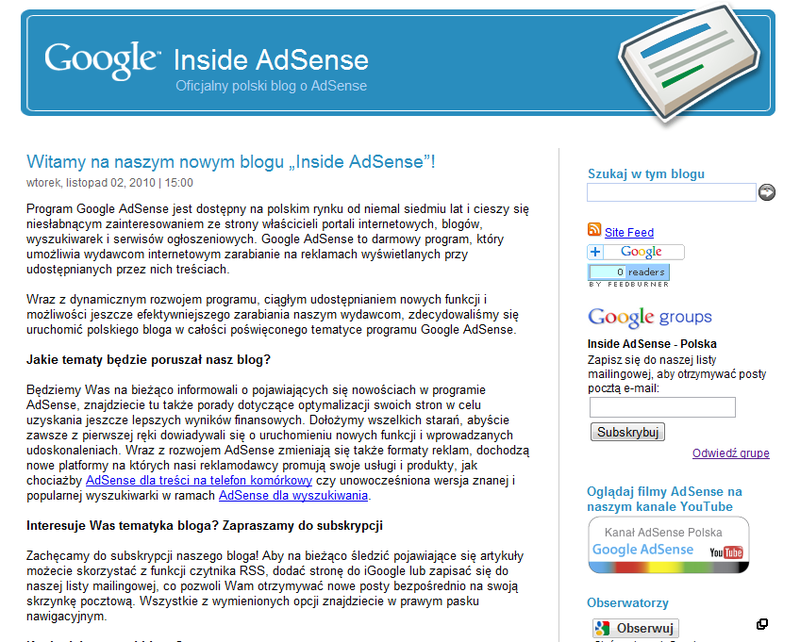 We’re very excited to announce the launch of our newest Inside AdSense blog: Inside AdSense Polska! Like our other Inside AdSense blogs, it will provide readers with optimization tips, product announcements, and other program information to help our Polish publishers maximize their earnings and make the most out of their Google AdSense accounts. Next week, our friends from the DFP Small Business team will be hosting a free online seminar to introduce AdSense publishers to DFP Small Business. For those unfamiliar with DFP Small Business, it's Google’s free hosted ad serving solution that helps website publishers manage and grow their online advertising business. If you don’t currently have an account, learn more and sign up for free today by visiting the DFP Small Business website. The webinar will provide you with an introduction to ad serving, a live demo of DFP Small Business, and best practices for setting up your ad inventory and trafficking an ad campaign. All publishers are welcome to attend the webinar, but please note the UK friendly start time of the session. Happy Halloween from the Google AdSense Team! When you check an item, you'll see the progress bar update accordingly. This will help you in several ways. If you're new to AdSense, you'll get a clear overview of what steps to follow to make the most of your account. If you’re already an experienced AdSense publisher, you'll also have the chance to revisit the basics, and further develop your use of the program. The progress bar can help you identify quickly how many of the recommended steps you’ve completed, and the checklist will suggest which step you can take next. We hope that this Help Center feature will be useful to you and help you grow with the AdSense program! If you have other great ideas for ways to help newbies get started with AdSense or thoughts on how to make the checklist even better, join the conversation in our forum. Starting a new program can be overwhelming. What steps should you take to get off on the right foot and make the most of your account? To help you make your way with AdSense, we're delighted to introduce the AdSense Checklist to publishers viewing our U.S. Help Center. If your language preference is set to U.S. English and you are logged in your Google Account, you'll find the checklist in the left navigation bar of the Help Center. You can recognize it by the progress bar. The checklist is divided into five parts, offering basic recommendations, required steps, and tips to help you grow your account to its full potential. Over the past several weeks, we’ve given you tips about how to take advantage of placement targeting as advertiser spend increases during the holiday season. In this final post of our “‘Tis the season for placement targeting” series, we’ll take a step back to talk about a popular topic that's generated buzz around Google and the online advertising industry: display advertising. This is especially relevant to this series, as the goal of placement targeting is to offer premium space to advertisers so they can effectively reach their audiences. And these days, when you're talking about premium space, you're usually talking about space that's devoted to display ads. Advertising on Google started out with four lines of text. In addition to the original text ads, you’re probably familiar with the image, video, and rich media ads we now offer. Did you know that, other than ads shown with search results, more than 40 percent of the ads that we show are now non-text ads? More and more advertisers are creating display ad campaigns as an interactive and engaging means to reach users. To take full advantage of these ads, refer to our last post on enabling ad units to show text and image ads. Display advertising is a big area of focus for Google. We believe that the new technology we’re developing to make display advertising work better will help to grow the display advertising pie for all publishers, by orders of magnitude. We shouldn’t be asking how publishers can make another 5 or 10 percent out of display advertising in the next few years. We should be looking at how the industry can double or triple in size. To learn more about Google’s position on display advertising and the steps we’re taking to push the thinking to the next level, read our recent blog post on the Official Google Blog. useful. Today we wanted to give you more advice on this topic and talk about ads on pages containing interactive media, such as videos and games. Now for the good news: If you are interested in monetizing overlay or in-stream placements on your video content, please check out AdSense for video. Similarly, if you are interested in placing ads on interstitial pages on your Flash gaming sites, read about AdSense for games. The key difference between using these products and AdSense for content is that with AdSense for games and AdSense for video, we only show ads from a pool of advertisers who specifically target these kinds of placements and have optimized their campaigns and creatives towards them. We hope you found our last post on invalid clicks useful. Today we wanted to give you more advice on this topic and talk about ads on pages containing interactive media, such as videos and games. 1. Implement your ad units above the fold and near your content, where users are already engaging with your site. “Above the fold” refers to the area on a page that a user can see without scrolling down. 2. Where possible, use top-performing ad sizes like the medium rectangle (300x250), large rectangle (336x280), leaderboard (728x90), and wide skyscraper (160x600). 3. Enable your ad units to show text and image ads, so that all relevant, available ad inventory is competing to appear on your site. Many advertiser campaigns are made up of image ads, so we highly recommend activating this feature to take full advantage. Once you've made the changes, not only will your ad placements be ready for this holiday season, but they’ll also be targetable by advertisers in future ad campaigns. To learn more about these topics, check out our YouTube videos on image ads and high performing ad units, or read more in our Help Center. Check back next week for more ‘Tis the Season for Placement Targeting tips!
. As you may know, the revenue you receive is based on the amount an AdWords advertiser pays for each click on their Google ad. The amount the advertiser pays varies per ad and from website to website, based on the likelihood that a click will result in a conversion for the advertiser. If we determine that clicks on a site are less likely to lead to business results for an advertiser (e.g., an online sale or registration), we reduce the price that an advertiser will pay for those clicks. So, in short: Moving the ads further away from Flash games decreases the likelihood of accidental clicks and increases the number of clicks leading to business results for advertisers. A good deal for all involved. In the past, we've talked about ad placements that are prone to generate invalid clicks. In a past post, for example, Mike noted that publishers should be careful about placing ads too close to navigational controls or other clickable page elements. It's in the best interest of the user, advertiser, and publisher to avoid implementations that lead to invalid click activity. As you can imagine, users aren't very happy if they accidentally click an ad instead of a link on your page and are directed away from your site. Advertisers also don’t want to be charged for a click that a user made accidentally (though of course we do not charge advertisers for invalid clicks that we detect). And why should publishers care? Well, if we see that most of the clicks coming from your pages are invalid, we may need to disable your account to protect our advertisers. One type of site we wanted to talk about are Flash-based game sites. Playing games on these sites, you'll notice that ads are often placed very close to the Flash player where the game is played. Publishers may reason that they're providing maximum value to advertisers by placing their ads very close to the area where their users are focused. However, many of these Flash games are played with a mouse, and the action in the games can lead users to do a lot of rapid cursor movements and clicking. We've seen many cases where ads were placed too closely to where the action was taking place, generating many accidental clicks. Since each game and site are unique, we can't advise publishers on an exact distance between ads and games, but we do recommend a minimum distance of 150 pixels between the Flash player and ads. We've worked with publishers on these issues in the past and noticed that increasing the distance between Flash player and ads has had, on average, a positive long-term effect on CPCs. The reason for this is smart pricing. As you may know, the revenue you receive is based on the amount an AdWords advertiser pays for each click on their Google ad. The amount the advertiser pays varies per ad and from website to website, based on the likelihood that a click will result in a conversion for the advertiser. If we determine that clicks on a site are less likely to lead to business results for an advertiser (e.g., an online sale or registration), we reduce the price that an advertiser will pay for those clicks. Last week, we introduced you to placement targeting as a great way to capitalize on the increase in advertiser spend during the holiday season. This week, we’re kicking off our three-part optimization series to help you maximize your earnings by taking advantage of DoubleClick Ad Planner. Ad Planner can help you market your site, make it easier for advertisers to search for you, and improve the data that these advertisers can see. As you may recall from last week’s post, the first step to enabling placement-targeted ads to appear on your pages is to set up your custom channels as ad placements. Ad placements are specific groups of ad units where an advertiser can choose to place their ads using placement targeting. This enables advertisers to better identify websites that reach their target audiences based on the descriptions publishers provide about their sites, describing the content of their pages or the type of users who visit them. Turning custom channels into ad placements is simple. To learn more, check out our YouTube video and visit our Help Center. Once you’ve set up your ad placements, we encourage you to try out DoubleClick Ad Planner, a free media planning tool that helps advertisers find the sites their audiences are likely to visit and helps publishers make their sites easier to target. In Ad Planner, you can claim the sites you own and customize their descriptions. For each site, you can also add up to five categories that describe your site's content, and the types, sizes, and formats of ads that your site supports. Doing this allows advertisers to easily find ad placement descriptions that match the interests of their target audiences. More targeted ads leads to a better user experience on your site and a greater opportunity to increase your earnings. For more information on how to get started, watch this brief introduction to DoubleClick Ad Planner and sign up today. Western Union Quick Cash payments will reach you faster than checks, and they're free of charge. Payments will continue to follow our normal payment schedule and will be available for pickup in your local currency at your local Western Union agent the day after they're issued. With the holiday season fast approaching, everyone is spending more online. As consumers start shopping for gifts, searching for holiday activities, and booking vacations, advertisers are putting more of their marketing dollars online to reach these potential customers. This means there is an increased demand for the ad space on your site and an opportunity for you to earn more. To help you capitalize on this trend, we recommend you take advantage of placement targeting. Many advertisers create targeted brand campaigns at this time of year that are shown on AdSense sites in the Google Display Network. In fact, 99% of Google’s 1000 largest advertisers run campaigns on the Display Network. To ensure their brand is noticed by the right shoppers, advertisers will often use placement targeting to show their ads on websites in the Display Network that cater to their target audiences. You can take advantage of this holiday increase in advertiser spend, and help advertisers placement target specific sections of your site using a feature called ad placements. By creating an ad placement, you’ll make sections of your site available to be targeted directly by AdWords advertisers. Imagine a sport shoe manufacturer. To ensure his shoes get to the right consumers for the holidays, he may want to select sites within the Display Network that appeal to 25- to 34-year-old athletic males looking to purchase athletic shoes. As a publisher with a sports site, you can create ad placements for specific segments of your site so that the sport shoe manufacturer can find you based on these criteria. You can provide descriptions of your site, general demographic segment / audience information, and where the ads appear on your site. Placement targeting connects you directly to the advertisers who want to reach your readers, and are ready to spend their holiday budgets to do just that. In the coming weeks, we’ll post more tips on how to make the most of placement targeting. In the meantime, check out the Help Center and this video to learn more about placement targeting and how you can get started. The sooner you do so, the sooner advertisers can see your ad placements and potentially include you in their holiday campaigns! , a tool designed to help advertisers bid efficiently and effectively on many publishers’ ad auctions at once. Our Chief Economist, Hal Varian, explains the purpose of smart pricing, how it plays a role in the ad auction, and how it benefits the entire advertising ecosystem of publishers, advertisers, and users. Although we aren’t able to provide detailed explanations of our algorithms, we’d like to address a common misconception and show that smart pricing isn’t intended to be a ‘punishment’ for publishers. It’s designed to increase advertiser confidence in AdSense sites by helping them set more accurate bids that reflect the business results they’re looking for. This then allows advertisers to increase their maximum bids, which ultimately helps publishers earn more in the long run. Finally, we’d like to take a moment to address some of the questions we’ve received about the relationship between smart pricing and the AdSense for content revenue share. Smart pricing can impact which ad wins an auction for a particular content page. However, since the revenue share is fixed for all publishers, smart pricing doesn’t impact the percentage you actually earn for a valid click. Any changes to advertiser bids as a result of smart pricing will proportionately affect the amount both Google and the publisher earn. Thanks for following our two-part earnings series. We hope you found the content useful, and that you now have a better understanding of the factors that influence your earnings. Last week, in the first half of our series designed to help you better understand your earnings, we introduced you to the ad auction for AdSense for content. To recap, eligible ads compete to appear on your pages; our ad auction determines which ads show, and how much you can potentially earn from them. Now, let’s talk about smart pricing, a tool designed to help advertisers bid efficiently and effectively on many publishers’ ad auctions at once. Our Chief Economist, Hal Varian, explains the purpose of smart pricing, how it plays a role in the ad auction, and how it benefits the entire advertising ecosystem of publishers, advertisers, and users. Even if you consider yourself an AdSense expert, you’ll probably learn a few new and exciting tips from this series. Take a look at the 'Upgrade to high-performing units' video below, check out all six videos on the official AdSense YouTube channel, and visit our optimization essentials center for more information. Did you know that a simple change like enabling both text and image ads can boost your eCPM and revenue? Or that a 300x250 medium rectangle typically performs much better in terms of revenue than a 250x250 square? Or that widening an AdSense search box can double the number of queries performed on your site, leading to higher earnings? If you didn’t, don’t sweat it -- the AdSense team and I have come up with a list of six top optimization tips and best practices that can help you earn more quickly. Many of our publishers’ sites and accounts aren’t fully optimized for AdSense, which means that they’re not earning as much as they potentially could. In these AdSense optimization videos, we walk you through some of the top optimization techniques and explain why they’re helpful in boosting your eCPM and revenue. Incorporating these techniques into your website and AdSense ad layout can help you monetize your traffic like never before! If you’ve asked yourself questions like these before, you’re not alone -- we often hear from publishers that they’re unsure of how earnings are calculated and why their earnings fluctuate. As part of our efforts to be more transparent with publishers, we’re kicking off a two-part series to help explain these topics. With the help of Hal Varian, the Chief Economist here at Google, we’ll show you how ads are targeted to your pages, priced by the ad auction, and translated into the earnings you receive. Today, Hal will introduce you to the ad auction for AdSense for content ads, and explain both what it’s for and how it works. Like a traditional auction, advertisers bid in our ad auction to show ads on your pages. The number and price of ads in the auction changes from moment to moment, based on how much advertisers are willing to spend and how they've set up their ad campaigns -- this is why we call our auction ‘dynamic,’ as these factors can then affect how much you earn. If you’re ready to learn more about the ad auction and how specific prices are calculated, watch the video below and visit our Help Center. So what can you do as a publisher to ensure you’re maximizing your earnings? Here are some tried-and-true tips to increase the amount of competition among advertisers in the ad auction for your pages. Keep creating high-quality sites full of original content to attract more advertisers, and use Google Analytics to see which content is generating revenue. Try adding popular advertiser formats such as the 300x250 medium rectangle to your pages. Turn your channels into targetable ad placements to help advertisers identify and target premium locations on your pages. Experiment to find the optimal locations for your ads, while making sure that your layouts won't generate accidental clicks. Help advertisers find your sites by claiming them in Ad Planner. You can add descriptions and categories that describe your content, which will help increase the visibility of your ad units to interested advertisers. That’s it for today. In Part II of our series, we’ll discuss how smart pricing affects advertiser bids in the ad auction, and clear up some myths about how it works. "Why do I earn more money from some ads and less from others? Why do my AdSense for content earnings vary from day to day, or week to week?" , we’re working on ways to introduce you to our Top Contributors to the help forum. A Top Contributor (TC) for over a year, Gracey tells us about why she became a TC, shares some of her experiences as an AdSense publisher, and provides some tips for all of you. We hope you enjoy getting to know her, and continue to visit the help forum with any questions you may have! What does it mean to be a Top Contributor (TC), and what do you like about it? Being a TC gives me the ability to call on an AdSense Pro to help out someone who really needs help; for me, that's one of the main reasons I accepted the invitation. The other thing I really enjoy about being a TC is the ability to call on other TCs for help when a situation has me stumped. All of the TCs are good people, each with different areas of expertise. I believe in 'paying it forward' or the old adage 'what goes around, comes around,' so in helping others, I believe that someday when I need help, there will be someone there to help me. What it doesn't mean is that I'm any smarter than the next publisher -- most of what I know came from the AdSense Help Center and from my own experiences, and these are things any publisher or volunteer in the help forum can learn. I like that being a TC, I learn something new every day. Helping others to resolve issues often means searching for answers I don't already have. Being a TC also doesn't mean that any of my sites are exempt from being disabled. Just like any other publisher, my sites must meet quality standards and follow all the AdSense program policies and Webmaster Guidelines. No, I'm not employed by Google in any capacity. I'm simply a publisher -- one who ran into her own problems a while back and came to the help forum for guidance. I stuck around the forum because I started learning things that I didn't know before. What is your experience like as a publisher? I've been an AdSense publisher since 2005. I have about 13 blogs and 3 websites, with AdSense ads displayed on only two of my blogs and one of my websites. I’m careful to only use AdSense on sites I feel would be acceptable to AdWords advertisers. It's important to me to maintain the quality of my sites, and at this point in time my schedule is busy enough that I can only reasonably maintain 3 or 4 of my sites on a regular basis. One of my sites (without AdSense ads on it because it's about AdSense and Blogger) has been helpful for many new publishers. What's the most important piece of advice you can give a new publisher to help them make the most of AdSense? I think the most important thing new publishers can do for themselves is read. Read everything available in the Help Center that relates to the products you are going to use, and do that before putting ads all over your website. One other thing I'd tell a new publisher is to ask for clarification in the help forum when he or she doesn’t understand the meaning of a policy. AdSense provides a great deal of information to help publishers, but many of them run full tilt to the ad code and never look back at the policies and guidelines. How can publishers best utilize AdSense for content? AdSense for content requires some work and diligence. Rather than just grabbing ad codes and plastering them wherever you can on a site, take the time to set up test ads on your site pages. Setting up a different ad size, format, or color combination on various pages throughout your site can help you discover the ones that may be the most effective for you. Use custom channels for each ad on each page during this simple test and give it some time. After a month or so, when you view the reports for each of these ads you should have a good idea of what ad formats and colors work best on your site. As we mentioned in our post last week, we’re working on ways to introduce you to our Top Contributors to the help forum. A Top Contributor (TC) for over a year, Gracey tells us about why she became a TC, shares some of her experiences as an AdSense publisher, and provides some tips for all of you. We hope you enjoy getting to know her, and continue to visit the help forum with any questions you may have! in the Custom Search Element. This enabled you to choose from among a palette of predefined styles. You can find a style that matches your website and start using search, or further customize the style if you like. We’re taking themes one step further. Each theme now has ads displayed with a look and feel that match the overall style used for the search results. The result is harmony between search results and ads, which we think makes for a great user experience. The following screenshots show search results and ads for three different themes: espresso, minimalist and green sky. We hope you agree that your visitors will enjoy themed ads. As always, be sure to send us your feedback. Last year, we took a big step forward in improving customization of the look and feel of results by providing plug-n-play themes in the Custom Search Element. This enabled you to choose from among a palette of predefined styles. You can find a style that matches your website and start using search, or further customize the style if you like. good at recommending just the right stuff for their users. We love seeing influential publishers in all genres — from foodies to techies to moms to shopping experts — delight users by giving them access to products and services that they believe in. When these trusted publishers recommend a book, a gadget, or a new perfume, their audiences are very likely to follow. Have you ever wondered if your users buy the products you recommend? Have you wished you could be rewarded for driving sales and conversions? You can. With Google Affiliate Network, publishers can access cost-per-action (CPA) or affiliate ads. This means that you can start working with advertisers who will pay you a performance fee for driving a sale or other conversion. Many AdSense publishers have already started using Google Affiliate Network to complement their AdSense ads and earn additional revenue. Sign up for a Google Affiliate Network account with your AdSense Publisher ID. As soon as you're approved for Google Affiliate Network, sign in and apply for advertiser programs. Follow the instructions to start displaying cost-per-action ads. How are Google Affiliate Network ads different from the ads I serve through Google AdSense? Affiliate programs are not ad units or campaigns; they are ongoing programs that allow advertisers to reward publishers (or “affiliate partners”) for driving sales or conversions. While your AdSense ads are automatically targeted, you will select which Google Affiliate Network advertiser programs to join and then choose which affiliate ads to add to your site. Can I promote my Google Affiliate Network ads? You may promote Google Affiliate Network ads on your site. If you endorse the product that you are referring, feel free to let your users know. By adding your personal review of the products you refer, you can help your users make more informed choices. Note that you may not promote or call attention to AdSense ads in the same way. Learn more about important differences between CPC and CPA ads that explain the reasoning behind these separate policies. What kinds of advertisers are in the Google Affiliate Network? We have a diverse range of advertisers who run successful affiliate programs through our network. Just a few examples include Target, Barnes and Noble.com, Blue Nile, Verizon Wireless, Aéropostale, and Wedding Channel Store (The Knot). Is this available for publishers outside the United States? Yes, publishers in all countries supported by AdSense are eligible. However, the majority of advertisers in the Google Affiliate Network are currently focused on the US market. If you've earned at least the minimum commission, you'll receive consolidated payments through your Google AdSense account. Many publishers are very good at recommending just the right stuff for their users. We love seeing influential publishers in all genres — from foodies to techies to moms to shopping experts — delight users by giving them access to products and services that they believe in. When these trusted publishers recommend a book, a gadget, or a new perfume, their audiences are very likely to follow. , a virtual meeting place where a community of publishers, advertisers, AdSense experts, and Google employees convene to discuss all things AdSense. If you browse through the discussions, you’ll notice replies from Google employees and non-Google contributors who are passionate AdSense publishers and experts. We rely on all of you to keep the conversations lively, providing each other with information that ensures the forum is a fantastic place for you to interact, troubleshoot, and learn from one another. You’ll also notice some posts from our Top Contributors. Top Contributors are the rock star volunteers of the forum who regularly help their fellow forum members by answering questions and providing product expertise. We trust our Top Contributors to give you top quality advice; in fact, the Top Contributors teach us new things almost every day! From optimizations to tuna fishing, they know a lot, and we’re working on ways to introduce some of them to you in the coming weeks. In the meantime, we encourage you take a look through the current forum discussions and join the conversation! If you’ve ever had a question about your AdSense account, you’ve likely visited our Help forum, a virtual meeting place where a community of publishers, advertisers, AdSense experts, and Google employees convene to discuss all things AdSense. Members of the AdSense team from all over the world say hello from Mountain View, CA! and update your email preferences under the ‘My Account’ tab. Want to be invited to upcoming events like AdSense In Your City? Make sure you check the box next to Special Offers when you edit your email preferences so you can stay up-to-date with giveaways and other special programs in your area. Want tips from the AdSense team for how to earn more with your AdSense account? Check Customized help and performance suggestions and/or Newsletters so we can offer personalized guidance to improve performance and maximize your revenue. Want to help us improve AdSense by testing out features like the new AdSense interface? Check Google Market Research and you’ll be able to share your valuable feedback with us through surveys and beta tests. Want promotions and key updates for other Google products that can help you grow your AdSense business? Check Information about other Google products and services which may be of interest to you so we can send you news and coupons based on your potential needs. We want to help you earn more with tips and promotions, invite you to in-person events, and gather your feedback so we can continue to improve AdSense. So log in, update your preferences, and take advantage of the opportunities coming your way from the AdSense team! Have you checked your AdSense email preferences lately? If not, you may be missing out on important information and special offers without realizing. Take a minute to log in and update your email preferences under the ‘My Account’ tab.